Tis’ the season to make gates. Coming into the gate season once again, the enquiries are coming in thick and fast. Regretfully I had to turn away quite a few in 2013 as we we’re fully occupied and at capacity with an enormous pair at called the ‘Tijou’ gates at Petworth House. This year we are fully open for designing and making some, big and small. I love making gates! Gates are pretty useful, they do the obvious! But have you thought a bit more about it? They can be used as focal point to draw your attention to or away from an area, they can extend a view or foreshorten, block and frame. They add texture and colour perhaps. They can definitely make a statement; but be careful with that one, because if you buy one from us the gate will last a very long time. Ultimately if you buy a designed, hand made one they add value and quality! Its so important to have it designed for you, don’t just buy it because you like the one you see on a website from a bloke 100 miles away, it is unlikely to turn up as it looks on the webpage and it doubtful you’ll get much recourse when things don’t go you way. Make the blacksmith earn his money, because unfortunately they aren’t cheap. Compared to the tinpot ones at the garden centre they are very expensive, but so is a Christmas Turkey compared with a can of chopped tomatoes. Like the analogy, its a treat for a special occasion. You could afford to buy tomatoes most weeks, but they are just……. I’m going away from my point here, I hope you get my drift? Get your chosen Blacksmith to come out, measure up and talk to you, discussing the possibilities and your options. 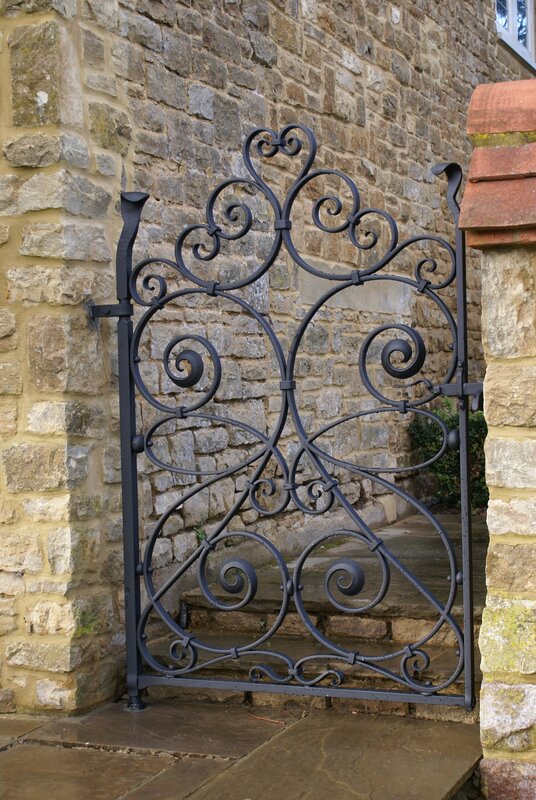 Remember gates don’t have to have scrolls and spearheads (god help me), some of the nicest and timeless designs are just rails and stiles. Detail is everything, textured bars, mortise and tenon joints, punched bars so that one passes through the next, half lap joints, rivets and sets, curves and corners, perhaps variants on twists (not that old barley twist you have on your fire poker), forged balls, changes of section and good old fire welded detail, mixed media looks good too, try adding in wood, glass or whatever. If your Blacksmith doesn’t mention any of these simple things, please don’t use him. Definitely don’t use him if he doesn’t show you some of his own designs, you know the ones, they are called ‘drawings’…… if he can’t draw, getting across his plans and intentions, its unlikely you’ll end up with what you want or deserve. 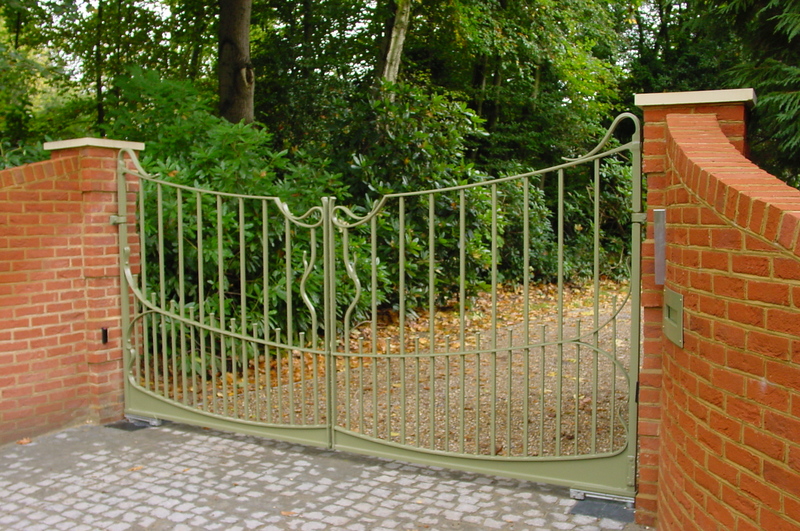 The design(s) that arrives with your quotation (why should he/she give an estimate, its a gate?) should reflect your meeting and discussion, taking account of the site situation, house design and all the personal factors that a bespoke service delivers. If you don’t like what you see or the price, just say, most designers and artists have a back up plan for such eventualities, well, I do! And if you do like it but want it tweaked, don’t be afraid to to mention it either. 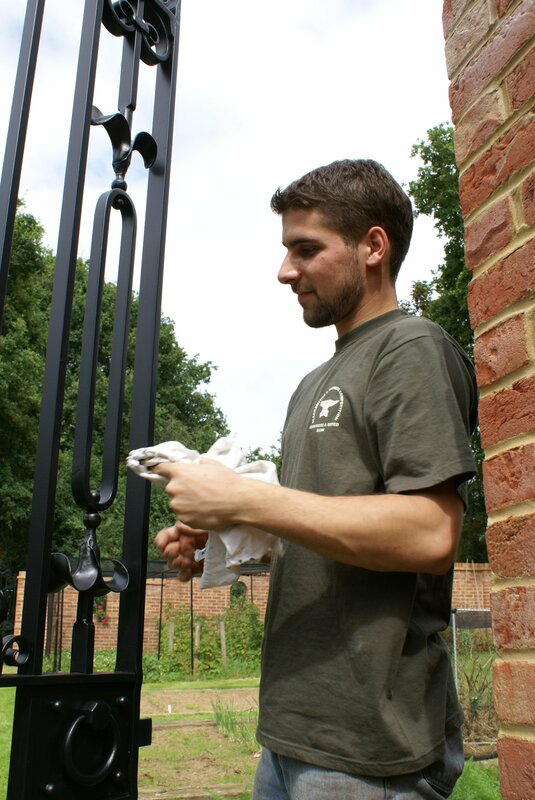 Finishing touches to installation of wrought iron gate. Did you talk about finishing and installation? Well your Blacksmith should have mentioned it, finishing is so important. 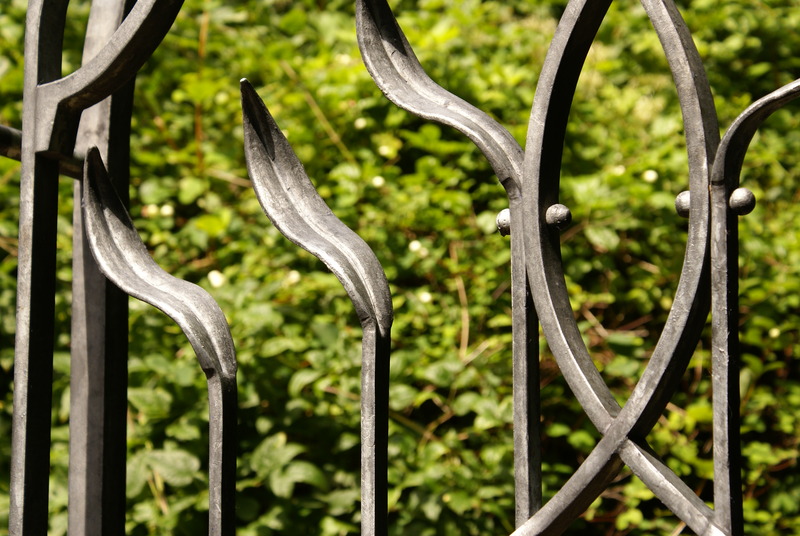 Your gate is likely to be made form forged Mild Steel, it rusts I’m afraid, and once it starts you are unlikely to stop it. So included in the quote should be a zinc application of some sort Galvanizing is the toughest or Hot zinc spraying gives the best finish, both will protect your investment, don’t confuse zinc powder spray with hot zinc spaying, its not the same. Then after that it needs painting professionally with a quality paint system. You shouldn’t need to worry about that because the Blacksmith will have included that? Well, I do. There are options of finish, once its protected against rust you can do what you like within reason, graphite loaded paints, phosphated zinc, you name it. Installation, if the Blacksmith doesn’t include that you should be suspicious; they have gone to all that trouble to design it, make it, finish it…. they not going to let it out of their sight until its up and safe… are they? If they don’t care how its installed they probably didn’t care in the first place. Nuff said!Having the gate installed (and working) by the Blacksmith who made it should be the indicator that the job is done and it time to pay the balance of the bill (you would have paid a deposit to start). That’s it? Well ask about aftercare, quality gates don’t need painting to often, once every 6 or 7 years maybe, they can be washed off in between, maintaining the finish by cleaning off algea etc. don’t use caustic soaps though, Washing up liquid is the worst, car shampoo is OK, or just water! Any problems, get them back to fix it. Remember you have paid a good price and deserve proper service, a reputable Blacksmith will want you quiet as soon as possible, commending him/her for their speedy attention to the problem.